Clark Gardens Botanical Park, located just 45 minutes from downtown Ft Worth, offers an idyllic setting for garden weddings. Clark Gardens has 11 different venues to choose from. We offer a beautiful English style Channel Garden, a 6000 square foot, carpeted tent, gorgeous lawn settings, an indoor Chapel and covered gazebos next to peaceful lakes. Our packages include your rentals for both the wedding and receptions. This lawn serves as a classic lawn setting and is beautiful for any occasion. The lush grassy area is bordered by a rose covered arbor. At approximately 5,000 square feet this spacious, open site can accommodate 350 guests. The elegant Channel Garden has majestic fountains and tiered walkways. The Channel Garden includes two 700 sq. ft covered, furnished pavilions. Chairs may be placed along the tiers for seating. This garden can accommodate 400 guests. Multiple pathways and lawns create an enchanting atmosphere for any event. Event surroundings include the serpentine wall of the Meditation Garden to the South, the White Garden to the North, Lion's Head Fountain to the West, and the Rose Arbor to the East. This location can accommodate 300 guests. Fed by four waterfalls, a tranquil lake surrounds the beautiful cedar pavilion. The lighted pavilion has antique white tables and chairs, ceiling fans, a large counter top, and small sink. This location can accommodate up to 100 guests for a wedding ceremony or 50 guests for a seated reception. On the banks of Oxbow Lake, this 1,400 sq. ft. lighted pavilion includes tables and chairs, a large counter top, small refrigerator, and ceiling fans. In season, colorful hanging baskets and terra cotta planters surround the pavilion. This location can accommodate 100 guests for a wedding ceremony or 50 guests for a seated reception. Surrounded by the scent of roses the covered arbor leads up to a 1000 sq ft pavilion. The facility's waterfall is the perfect backdrop for any event. The lighted pavilion has tables and chairs, ceiling fans, large countertop, sink and a small refrigerator. There is ample room for additional seating on the lawn surrounding the pavilion. 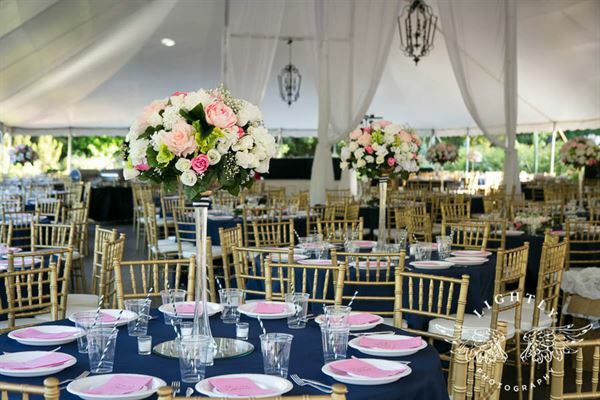 This location can accommodate up to 115 guests inside the pavilion or 150 guests on the lawn. Enjoy the serene setting of Summer House - a large open top gazebo with tables and seating with a large lawn area for ceremonies or receptions. A featured fountain and colorful hanging baskets are what make this location picture perfect. Summer House Lawn includes a dance floor and can accommodate up to 200 guests for both a ceremony and a reception. The West Tent is a 5,000 square foot permanent tent sitting among the iris and rose beds. It includes chandelier lighting, a permanent stage, dance floor, and bar area and can accommodate up to 200 guests. Clark Gardens is situated just outside the tiny town of Mineral Wells, a suburb of Ft. Worth. It hosts an array of beautiful flowers that are always changing with the season, and several different families of peacocks, quail and swans. The gardens are almost unheard of outside of the Mineral Wells area, leaving them unpopulated by tourists, and the flowers, mercifully untrampled upon. They grounds has its own chapel, perfect for any wedding, with cool stone flooring, traditional pews, and a small garden in the back for taking pictures. Once your vows have been said, and all responsible parties have said, ""I do,"" you and your guests may adjourn to the canopied reception area nearby. This location has its own dance floor and an area designated for a DJ or band. This spot comes with tables, chairs, linens, and should you like, catering. The Clark Garden staff can arrange all of this for you upon request. From the reception area, you can see a beautiful koi pond filled with lilies, and impressive fountains, with additional seating in the rear. This spot is also ideal for taking pictures, and impressing your guests with decorations that only nature can provide. Perhaps the best part about hosting your big event at Clark Gardens is that wherever you go, the beauty of nature will surround you. There are rose gardens lining the pathways, and peacocks strutting around the trees and bushes. While the Dallas/Ft. Worth area is full of chic, hip places just begging you to pick them for your wedding venue, you will never find a place as untouched as Clark Gardens. The Oaks Event Center is an elegant venue located in Fort Worth/Burleson, Texas. We are situated just south of Fort Worth on the beautiful Southern Oaks Golf Course. We offer multiple indoor and outdoor settings for your Special Event. From our exquisite presentation of food to the exceptional service and elegant atmosphere, the Oaks Event Center is the perfect location for your private event needs. Our commitment is to provide first-class planning, quality cuisine and service that makes your event unforgettable to you and your guests. Our attentive staff will ensure your planning goes smoothly from start to finish, and that your special day is unforgettable. There’s also plenty of parking for you and your guests, as well as the option of a valet. Our expert private event directors can arrange any event, from the most intimate of gatherings to a reception for hundreds to your corporate golf outing. When hosting an event, whether for business, friends or family, you will be proud to have made the right decision. Our 3 different meeting rooms measure at 720, 576, and 480 square feet respectively. Room layouts include reception, banquet, theatre, classroom, conference, and U-shape. Also, you get amenities like free WiFi, and a guest use copy and fax machine when you choose our Burleson meeting areas. Are you looking for that ideal location to host your next meeting or conference? Stay Express Hotel offers a wide variety of spaces ranging from 250 square feet all the way up to 4,000 square feet. Our meeting facilities can accommodate group sizes from 10 – 300 people and our team of planning professionals are dedicated to making your banquet, conference, meeting, party, or wedding everything you envision! Eldorado Country Club is the premiere Ceremony and Reception facility in the McKinney, Allen, Frisco, Melissa, Anna, Fairview and Collin County areas, offers you and your guests elegance, prestige and exceptional service. Our breathtaking views and exquisite facilities make for a truly romantic reception that you and your guests will always remember. Eldorado will make your vision of the perfect wedding day a reality. Select from our elegant wedding packages or we can customize a package especially for you. At Eldorado, we design weddings with your needs and budget in mind. Our wedding packages include complimentary parking, full open bar, hors d’oeuvres, seated gourmet meal or bridal buffet, and so much more. The Eldorado Ballroom can accommodate up to 350 guests or for more intimate events, please ask about the Hillcrest, Timbercreek or Governors room. Every detail matters and no request is too small or large. It is your day and we want it to be perfect! The Grand Hall at NRH Centre is an ideal venue for your upcoming wedding, business meeting, social event, reunion or banquet. Located in the heart of the Metroplex, just minutes from DFW Airport, the Grand Hall offers 9,500 square feet of flexible, state-of-the-art spaces. It is designed to be both contemporary and elegant. Spacious one minute and intimate the next.